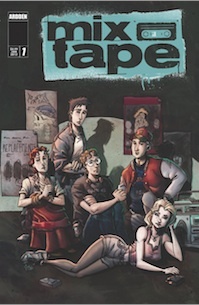 Available to order now from Previews is the first issue of a new indy series from Ardden Entertainment, Mixtape, written by Brad Abraham, art by Gervasio and Jok. It’s the story of a group of friends, about to be high school seniors, and the choices they make. Issue #1 takes place at a party on the last Saturday of summer 1990. Jim is giving Adrienne a ride. She spent the summer in London, broadening her horizons and losing a good deal of weight. At the party, we meet the rest of the gang: Noel is the clueless host, Terry the geek searching out the next thing, Lorelei Jim’s smarter friend whom he won’t listen to anyway, and Siobhan the girl Jim’s always had a crush on, back from Italy and newly single. Writer Brad Abraham is a screenwriter (RoboCop: Prime Directives), which likely accounts for how developed the characters are and how dense the dialogue. The black-and-white art is thickly detailed in setting and expression and nicely scratchy in line, keeping with the mood of the alternative bands mentioned: the Pixies, particularly, but also Sonic Youth and The Smiths. The title emphasizes how important music is to these kids. This is soap opera from the nostalgic perspective of the older and wiser, tied together with a strong hook of well-remembered bands providing the soundtrack to life. Mixtape #1 is due out in February and can be ordered from your comic shop with Diamond code DEC11 0835. You can find out more about Abraham’s take on music at his website.